Alma Rubens was born Genevieve Driscoll in San Francisco Feb. 19, 1897. She attended the Convent of the Sacred Heart, but decided in the early 1910's that she preferred acting and changed her name to Alma Rubens. Through her stage work, she met Franklyn Farnum who introduced her to director Rollin Sturgeon. This was the beginning of her film career, and her earliest roles included "The Lorelei Madonna" (1915) and "Reggie Mixes In" (1915) with Douglas Fairbanks. However, her real break came when she was co-starred with Fairbanks, in "The Half Breed" (1916). She continued to work regularly including a small part in D.W. Griffith's "Intolerance" (1916), another Fairbanks film "The Americano" (1917), and a William S. Hart film "The Cold Deck" (1917). She and Farnum married in 1918 but separated within weeks. During these years, Rubens was busy making a number of films for Triangle, however, the company folded in 1919. She worked for a while with Cole-Robertson and then Pathé before signing with Paramount. She was also arrested in 1919 for drug possession and sentenced to dry out at a state hospital. 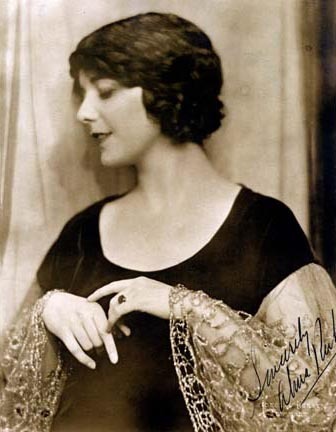 She continued to work regularly in films through the early 1920 without any major productions to her credit. She married screenwriter Daniel Carson Goodman in 1923, but separated after a few months. They were officially divorced in 1925. She continued a very successful career in the mid-twenties, and, while working for Fox in 1926, married Ricardo Cortez. From this point on, her film career began to come to a swift end, no doubt as a result of her drug usage. She made only one film in 1927 and one in 1928. She was arrested twice around this time for disorderly conduct, and finally collapsed in January, 1929, from a drug overdose. She spent six months at the California State Insane Asylum. Once released, she was able to go back to films making the part-talkie "Show Boat" in 1929, and then her last film, "She Goes To War," a part-talkie with Eleanor Boardman. Cortez filed for divorce at this time, and she went east for a stage show that unfortunately folded after one week. She came back west hoping to renew her film career and patch up her marriage, but she ran into trouble when police searched her home and found morphine. She was released on $5,000 bail. She never made it to trial, later going into a coma and dying on Jan. 21, 1931.